Karmay Queen of the Sahara Gorley (Yes, that is her real legal name, I like to call her Koko, Koqueen, Karmen, and QOTS!) will go down in my herstory book as my first true friend. We met at 14 years-old at Tucson High Magnet School in Arizona. The way she tells the story is this, "I remember when KLC and I first met freshman year in English class. You were so popular and already had so many friends. I asked you to show me where our next class was and that was pretty much the start of a beautiful journey." It felt easy and natural to befriend Karmay. She was warm, kind, and curious about the world around her. There were two lunch periods and most of our friends had the other period so Karmay and I would have lunch by ourselves by the tennis courts. And as Karmay shared, that was the start of something beautiful. From there, Jake Michael came into our lives. Another Leo and fearless leader at our school. Jake was Class President every year including Student Body President our Senior year. This exposed Karmay and I to a new way of being, the privilege of being involved, being of service and doing close to whatever the hell we wanted. We became the "Tres Amigos" and throughout high school went on adventure after adventure. Whether it was across the border to Mexico for a weekend trip or across the street to get Eegee's or Taco Bell, it didn't matter what we did, as long as we were together. After high school we went our separate ways, Karmay to Westiminster College in Utah, me to Arizona State University in Phoenix and Jake stayed in Tucson to attend University of Arizona. Leaving our Tres Amigos friendship bubble felt like extreme culture shock for me. We had endless inside jokes spoken in all of these accents, I was in it so deep, to the point where I didn't know what my actual voice sounded like. Eventually, we all adapted and made new friends but remained close. Every winter or summer break we'd reconnect in Tucson. Jake later moved to Phoenix and he and I lived together for three years. It took us close to five years but eventually we even visited Karmay in Utah! After college, Karmay took a leap of faith and moved to the bright lights, big city of New York. What a brave, fearless, and strong woman I thought. Seeing Karmay fly gave me the courage to take my own leap of faith and move to my dream city, San Francisco. Many bicoastal visits later we've taken our biggest leap yet. 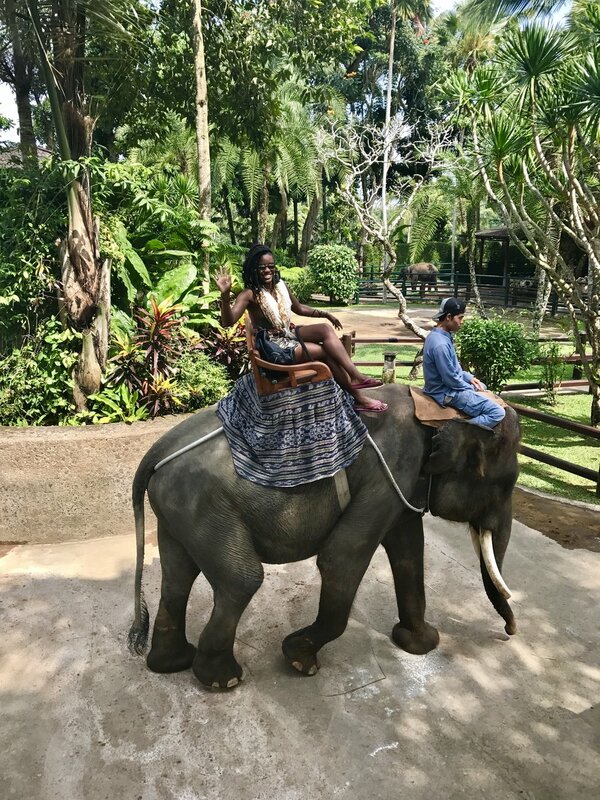 I've expanded to Southeast Asia and Karmay is my first friend to fly 9,000 miles (as she keeps reminding me) from New York City to Bali, Indonesia. Traveling with friends or anyone for that matter no matter how close you are can be challenging. We decided to do some pre-work before our trip together to clear the energy and set the space for an adventure of a lifetime. Our intention was to start from zero and to meet the new women we've grown into. 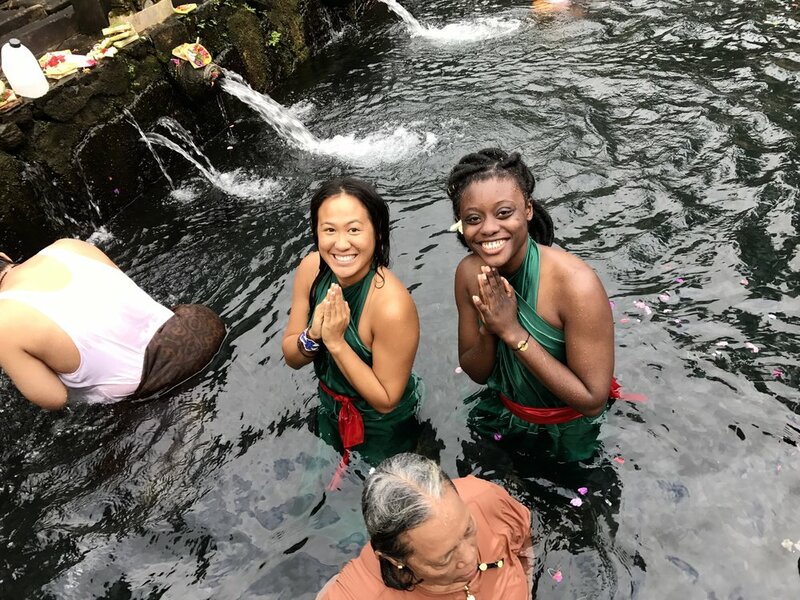 Tirta Empul, Holy Spring Water Temple for Lotus' 28th (Re)birthday! 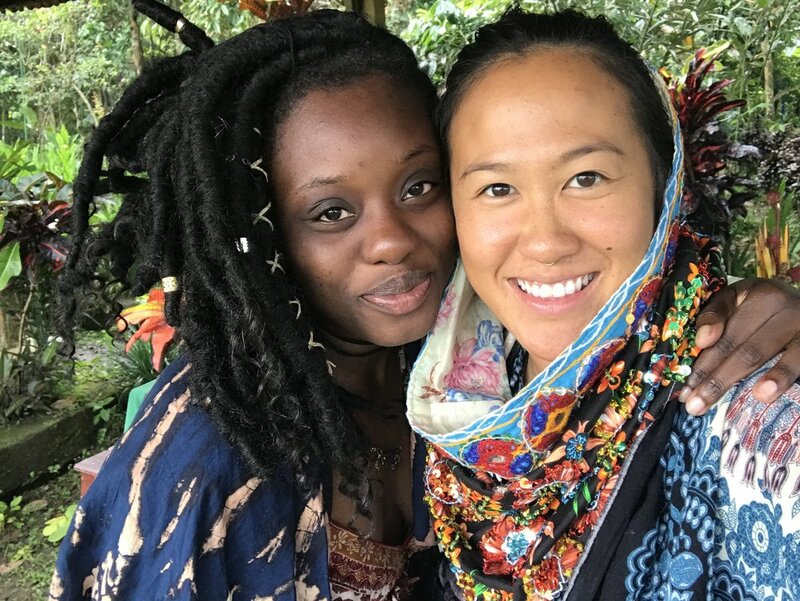 We had three calls before our trip where we used conscious relating tools like: Desires, Fears, Needs and Full Presence Listening to see and hear one another fully. We also had a really important conversation about shared expenses and our relationship with money that stemmed from childhood and how our parents managed money. These conversations may sound intense and excessive but true friendships require an energetic and emotional investment. And honestly, this stuff works. Karmay and I have maintained a close friendship that keeps growing and expanding over the last 14 years because we are willing to have courageous conversations like these. I truly believe that the willingness to work through what matters, together, makes all the difference in the world. 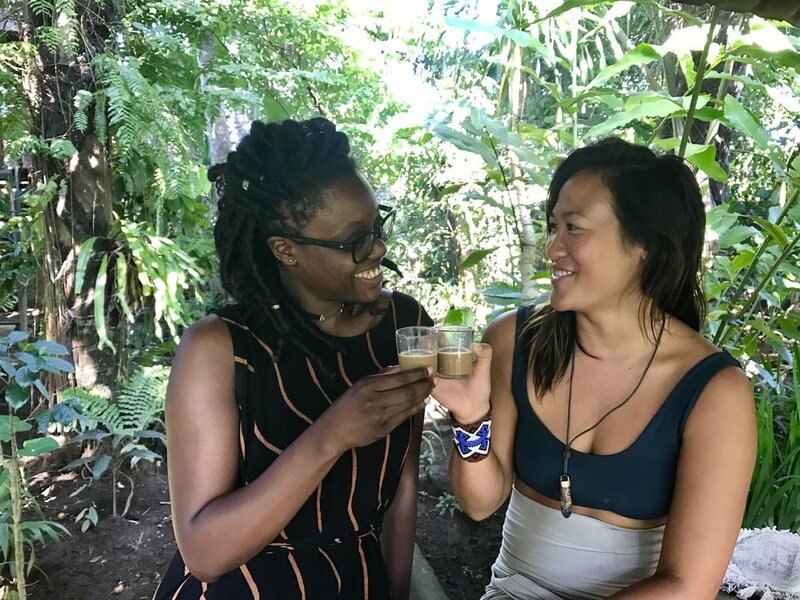 Naturally, we still triggered each other a few times on our trip but we worked through these conflicts patiently from a foundation of trust, self-awareness, and love. Agus Palm Reader's Home - highly recommend a visit with Agus! Alam Sari Kopi Luwak coffee & tea time - Luwak coffee (only made in Bali) and Ginseng coffee - AMAZING! Riding all over Bali for five days with our new best friend and the best taxi driver in town, Bagus! If you need a trusted driver in Bali, Bagus is your man (+62 821-4470-2030). Tell him Lotus' and Karmay sent you! Beyond the sights, what has brought me the most delight on this trip is witnessing the beautiful evolution of this woman right before my eyes. From the shy curious 14-year-old I met in the sunny Tucson desert to the smart young woman I met in Utah. 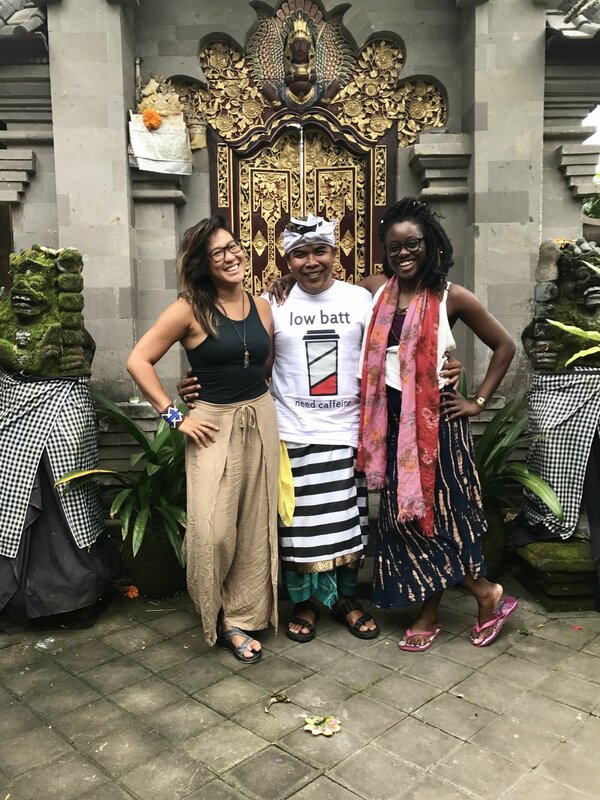 To the fierce boss lady I met in New York and now to the gracious Queen of Bali. Well I was originally calling Karmay "Miss America" because of the way this queen walks in the streets. Waving warmly and saying hello to everyone she meets. Kissing every baby, cuddling every puppy, and connecting with every shop owner and hotel receptionist along the way. Karmay embraced the Balinese people like they were her own. You could see the radiant energy beaming from her. Here she was able to shed the exhausting armor of being a black woman in America and simply be herself, a human who's just trying to live her best life like everyone else. Later she reflected to me she felt a sense of wholeness and acceptance here like she had come home. What further confirmed this feeling was the Palm Reader, Agus who shared that Karmay is an old soul. 900 years to be exact with roots originating in Asia. The Queen of Bali had finally come home. Endless gratitude to this Heroine for making the 9,000 mile trip, biting the $1400 plane ticket, and taking 12 days off to come visit me. Words can hardly express my love and appreciation for you. From learning how to take care of oneself, to going to sleep early, to trusting one's inner voice, you have taught me so much in our time together. So many blessings to you as you make your voyage safely home. I thank you, I love you, I celebrate you, I honor you. I treasure you. You are free! P.S. for a Master List of Bali / Ubud Tips, see shared Google Doc with contributions. Thank you, Troy Swanson and Teresa Yung for spreading the love!